The Swisher Commercial Pro ATV Spreader allows you to spread grass seed, fertilizer, salt and sand quickly, easily, and consistently. The universal fit lets it mount easily onto any ATV. Control the flow rate with the operator accessible adjustable feed gate. The spreading range can be adjusted from 4 to 16 wide depending on material, and a unique spinner disc and vented cap design provide consistent flow and even material distribution. New frame mounted on & off switch allows you to control the spreader without getting off your ATV. All control plates are zinc plated for better corrosion protection. This spreader is made with a heavy-duty ball-bearing motor, a sealed lid to keep out unwanted moisture, and an opaque 15 gallon and 150 lb capacity poly tank hopper. Keep your lawn healthy by removing excess thatch build up with this 48-inch Dethatcher tool by Ariens. The dethatcher allows fertilizer and water to penetrate into the ground and gets proper airflow moving to plant roots. A true must-have tool for spring yard cleanups! This large-capacity 125 lb., 2.5 cu. ft. Broadcast Spreader is perfect for seeding and fertilizing lots 1/2 acre and larger. Brinly spreaders are built to last; heavy duty polyethylene hoppers won't rust or dent and stainless steel interior hardware that won't corrode. And the fully enclosed gearbox eliminates down time so you spend more time spreading and less time repairing. Brinly also uses a patented directional spread pattern, Auto flow, to ensure accurate and precise application. Use year round to apply seed, fertilizer, lawn chemicals and sand, salt and other snow and ice melting agents. Brinly's lawn rollers help with multiple chores from packing down newly sewn seed or sod to erasing damage from moles to frost heave. Brinly pioneered the use of polyethylene for rollers; they're easier to fill, empty and store, and they won't dent or rust. Over time, lawns accumulate a layer of old grass clippings, dead roots and other small debris, but the patented Brinly Dethatcher combs thatch and clippings onto the surface where they're easily bagged or re-mulched. This 48-inch dethatcher features 24 independently flexing dual tine tips for maximum thatch pick up as well as oil tempered spring tines with triple coil strength for durability. 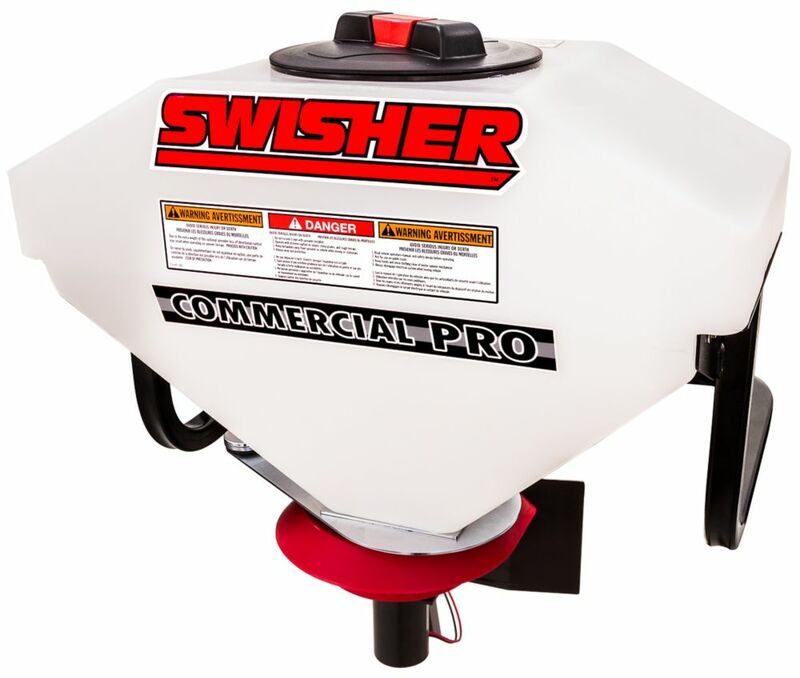 Commercial Pro ATV Spreader The Swisher Commercial Pro ATV Spreader allows you to spread grass seed, fertilizer, salt and sand quickly, easily, and consistently. The universal fit lets it mount easily onto any ATV. Control the flow rate with the operator accessible adjustable feed gate. The spreading range can be adjusted from 4 to 16 wide depending on material, and a unique spinner disc and vented cap design provide consistent flow and even material distribution. New frame mounted on & off switch allows you to control the spreader without getting off your ATV. All control plates are zinc plated for better corrosion protection. This spreader is made with a heavy-duty ball-bearing motor, a sealed lid to keep out unwanted moisture, and an opaque 15 gallon and 150 lb capacity poly tank hopper. Commercial Pro ATV Spreader is rated 3.7 out of 5 by 11. Rated 5 out of 5 by Andrew from Putting the spreader together was a serious pain. The directions were horrible. It comes with a d... Putting the spreader together was a serious pain. The directions were horrible. It comes with a dvd, but I didnt watch it, it might help. For commercial salt spreading the spreader is great! I used another "atv spreader" that was terrible. This has a easy to use handle and on/off switch. The power wire was to short to reach the front of the atv (connects to battery) Had to splice in more wire. Rated 3 out of 5 by Douglas from I love the spreader design and intent. It does take... I love the spreader design and intent. It does take a lot of time doing the assembly and confusing at time. Once assembled I am sure it would do a great job with seed or fertilizer. It does also run salt well. My issue is I purchased the item to run sand and or small gravel. I called the company before purchase and was told as long at the material was dry it would run with the design but they had not actually tested it. In the winter it is impossible to have sand perfectly dry and thus it DOES NOT work. I am presently does a test to see regarding the small rock chips. The item was bought to lay material while plowing and the cost of salt is extremely high so other abrasives for traction are needed. Rated 4 out of 5 by boathousebill from I am using this on a UTV so I had to create a mount and spray shield but it works just you would ... I am using this on a UTV so I had to create a mount and spray shield but it works just you would think. Rated 4 out of 5 by tmosk1 from This spreader seems to be perfect for my needs. I'm not 100% certain, as we have not had any sno... This spreader seems to be perfect for my needs. I'm not 100% certain, as we have not had any snow so far this year. I downgraded it 1 star because of the difficulty assembling the four bolt assemblies in step one. After several failed attempts I ended up holding the bolts in with some silicone. Rated 1 out of 5 by Anonymous from Don't waste money I do not know how this spreader works we had 5 acres to plant before rain came in. We purchased this thinking we could get the job done quickly. The company didn't include enough bolts are washers to put it together. Ended up using hand spreaders we had in the barn and we are returning this and getting one from a company that can at least supply nuts and bolts to put it together. Rated 3 out of 5 by Charles from Just received the 15 gal spreader, looks small, 30 gal is not available. I wish this spreader was... Just received the 15 gal spreader, looks small, 30 gal is not available. I wish this spreader was available in stores instead of Online Only. Turned out to be a lot smaller in person than it looks in photos. I have about 15 acres to put fertilizer, lime, and seed on so I will probably be refilling this thing quite often. Rated 5 out of 5 by Ohio from Easy to assemble. Worked great. Spread adjustment (application width) could... Easy to assemble. Worked great. Spread adjustment (application width) could be much more user friendly, but overall that's not a big deal. Would recommend!